Submitted by witness on Tuesday, November 21, 2017. OBSERVED: My son and I went trespassing up the Greenbelt Trail north of HWY 380, which has been closed for a couple years I believe due to flooding. A mile up the trail, we heard a distinct knock, though the distance almost made it sound like two rocks clacking together. My son also said he heard a whistle. As we retreated back to the parking lot, I snapped several pictures aiming behind me over my shoulder. One of the pics may have caught something interesting? It appears, to me, to be a figure crouching next to a tree, with exposed skin on the face. ALSO NOTICED: Took pics of various tracks, including human shaped, but no distinct features in tracks. OTHER WITNESSES: 2. My son and myself. OTHER STORIES: I have read about a few reports in the area. 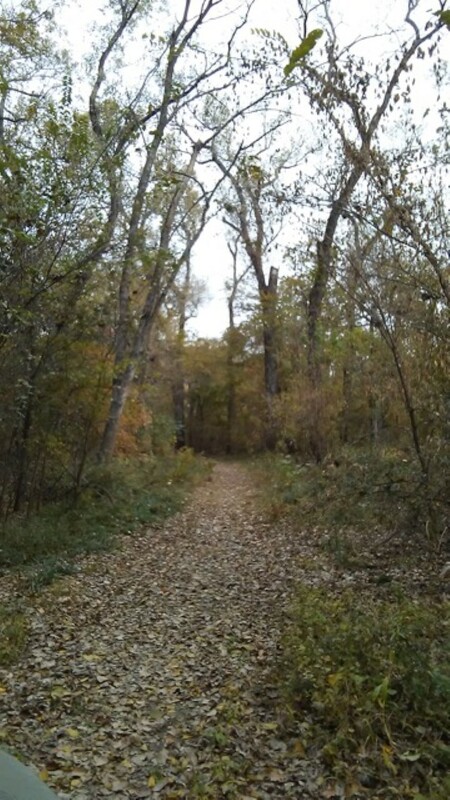 Several years ago, I discovered stick sign along this trail, Heard whistles and knocks, and found a 24 inch footprint, which I emailed to your organization. TIME AND CONDITIONS: Afternoon. Overcast. ENVIRONMENT: Thick forest, along Trinity River, enormous trees. I spoke with the witness by phone after he had moved with his family to Wisconsin. What he told me was consistent with his written report. He emphasized that the knock was very loud. In addition, he mentioned that on an earlier hike, he had heard what sounded like bi-pedal foot steps in the forest near him but could not see anything. Analyzing this photo, I zoomed in on the possible figure just off the path until the figure became too pixelated to determine what it was. The shape was consistent with a crouching figure, but there is little in the photo to determine size. The light colored “face” was unusual in my experience if it was a living creature. I have walked this path on multiple occasions due to other reported encounters. Wildlife is abundant. The path borders the east side of a small river that joins two large reservoirs. The west side of the river is, for the most part, an uninhabited forest. The witness was very consistent and sincere in his testimony. I believe that he may have had an encounter but his photo is not of sufficient clarity to determine if it recorded a living creature. But it does show you what the path looks like.